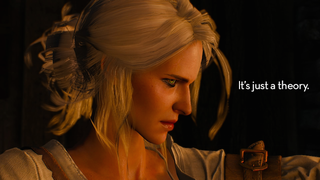 Partway through The Witcher 3, two characters had a conversation that got my head spinning. Heads up! Some plot spoilers for The Witcher 3 follow. Nothing too major, but if you want to experience the game totally fresh, better to steer clear. After the lengthy first act of The Witcher 3: Wild Hunt, Geralt and his adopted daughter Ciri are reunited. They haven’t seen one another for several years, and they spend a nice fireside chat catching up. Ciri is possessed of a type of magical blood that gives her the ability to open doors between worlds, teleporting to mysterious alternate dimensions at will. As the two reminisce, she says that she spent a significant portion of their time apart—half a year—hiding in one particular world that sounds… interesting. The minute Ciri mentioned people with metal in their heads, my ears perked up. The minute she mentioned flying ships, my eyebrows perked alongside them. Could she be talking about… Witcher-developer CD Projekt Red’s other big upcoming game, Cyberpunk 2077? “Things similar to megascopes” could be anything, then, from a digital communications device to some sort of cybernetic implant. To, yeah, something that has nothing to do with Cyberpunk 2077 at all. As Wild Hunt’s story goes on, we learn about a few other alternate dimensions, but aside from the one that directly involves The Wild Hunt, none are described with the kind of detail that Ciri includes in that first conversation with Geralt. She spent six months there, too, so she wasn’t just passing through. So! Any chance that when Cyberpunk 2077 finally comes out, we’ll run across a certain white-haired warrior lady in hiding? I have no idea if that’s how it’ll play out, but I could definitely see it happening. Or not. And that concludes today’s crackpot Witcher + Cyberpunk theory.